By Fr. A. James Bernstein – 337 pgs. The story of Fr. James Bernstein–from son of a Jewish rabbi and national chess champion, to leader with Jews for Jesus in Berkeley, California, to Orthodox Christian priest. ——- Surprised by Christ is the story of a man searching for truth and unable to rest until he finds it. Raised in Queens, New York by formerly Orthodox Jewish parents whose faith had been undermined by the Holocaust, Arnold Bernstein went on his own personal quest for the God he instinctively felt was there. He was ready to accept God in whatever form He chose to reveal Himself?and that form turned out to be Christ. But Bernstein soon perceived discrepancies in the various forms of Protestant belief that surrounded him, and so his quest continued?this time for the true Church. With his Jewish heritage as a foundation, he studied and evaluated, and eventually came to the conclusion that the faith of his forefathers was fully honored and brought to completion only in the Orthodox Christian Church. 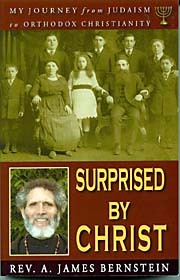 Surprised by Christ combines an engrossing memoir of one man’s life in historic times and situations?from the Six-Day War to the Civil Rights Movement to the Jesus Movement in Berkeley?with a deeply felt examination of the distinctives of Orthodox theology that make the Orthodox Church the true home not only for Christian Jews, but for all who seek to know God as fully as He may be known.